While closed-loop liquid coolers seem to perform at best comparably to the highest end air coolers, there's a certain appeal in their flexibility, stress on the motherboard, and sometimes even in cost. Prolimatech's industry standard Megahalems starts at $70, and that's before you even put halfway decent fans on it. Meanwhile, closed-loop coolers are getting to the point where you can find them for under $60. One of those is Corsair's H55, just one of the coolers we have in for review today. Of course, in addition to the H55, Corsair has refreshed their H60, H80, and H100s with the H60 2013 Edition, the H80i, and the H100i. The "i" designates Corsair's Corsair Link technology, software that allows you to control fan speeds from within Windows as well as potentially integrate and monitor other Corsair peripherals. Not to be outdone, NZXT hit us with two coolers based on 140mm fans instead of 120mm: the Kraken X40 and X60. With a 280mm radiator, the Kraken X60 could very well be the best closed-loop cooler available. This is all just surface, though. The reality is that these new coolers are almost uniformly indicative of an evolution of this product type as a whole. 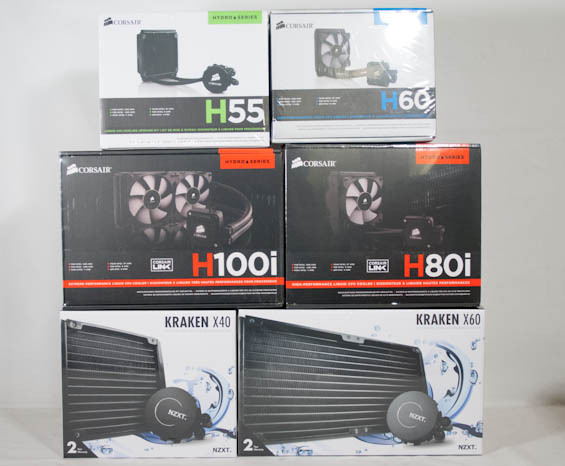 Corsair's H80i and H100i integrate with their existing Corsair Link software (also supported by their "i" series power supplies), while NZXT's Kraken coolers also include USB headers and their own fan speed control software. This kind of integration alone is a smart differentiation point from air coolers. They need it, too. What's important to keep in mind is that while there's some special sauce for the waterblocks, software, and fans from the vendors of these units, we're still ultimately looking at systems that are built by either CoolIT Systems or Asetek. You can tell who's responsible for which unit, too, just by the way the waterblock mounts to the motherboard. We may have six coolers in for review (as well as last year's incumbent, the Corsair H80), but there are only two different mounting systems. Everything else is just mounting the radiator and connecting the fans/USB headers. NZXT's coolers aren't available to mass market just yet, and we just got these review units in not too long ago. 140mm fan support in enclosures is fairly uncommon and dual 140mm even less so, but many of you seem convinced and I do agree that 140mm is really the direction things should be and are going. At first it seems like there's a pretty brutal premium on NZXT's coolers, but it's not as bad when you look at what they're competing against. The X40 is really facing off with the H80i, which is selling for a pretty hefty $109, while the X60 is doing battle with the H100i. Since the X60 is basically the largest closed-loop cooler you can buy (or at least will be), it makes sense that it would also be the most expensive. Let's hope for NZXT's sake it's also the best performing. As it's radiator is about double the thickness of the X60, the X60 has about 35% more surface area, and better preforming 140mm fans. This thing performs extremely good. Silence and cool. Maybe it's one of the benefits of 2x140mm. Corsair should've move to 140mm for the H100i/H80i when they updated it. On the other hand, choices for aftermarket 140mm fans are much lower than 120mm even though that's where the market should be heading to as you said. You said in the opening that not a lot of cases have a 140mm fan mount and dual 140mm are even less but for people who are buying these should have decent case already and most newer cases in the mid to high end segment can at least support a single 140mm. Yes I did mention that chassis these days have a 140mm fan mounts but what I was trying to point out is that most people who wants to spend $80+ for a cpu cooler should at least have a decent quality case already and quality case should have 140mm fan mounts.